Twice during our final week, we visited Waseda University, the Princeton of Japan. Our first contact was an American professor who attended UofM. He made getting around and getting set up with his students less complicated. That doesn’t mean, however, that communicating with the Japanese students was easy. It was actually pretty hard. While all of the students knew some English (they were English classes afterall), it was hard for us all to understand each other. Sometimes they didn’t know what I was saying and sometimes I couldn’t understand what they were saying. Another challenge was shyness. I don’t usually start conversations with strangers right off the bat so this was different for me. I also noticed that out of all the students I talked to, I was the one to initiate the conversation, except when I was with classmates, then my classmates were the ones to initiate the conversation, but none of the students I talked to initiated the conversation. This was very different from the Keio University students (who are their rivals might I add). However, I did have a few good conversations with some of the students. A sidenote would be to mention that these students helped us in our research projects by taking the surveys used to gather research for said projects. We met with at least 4 groups of students over a 2 day period and I’m sure the data collected from them will be very beneficial to our project. 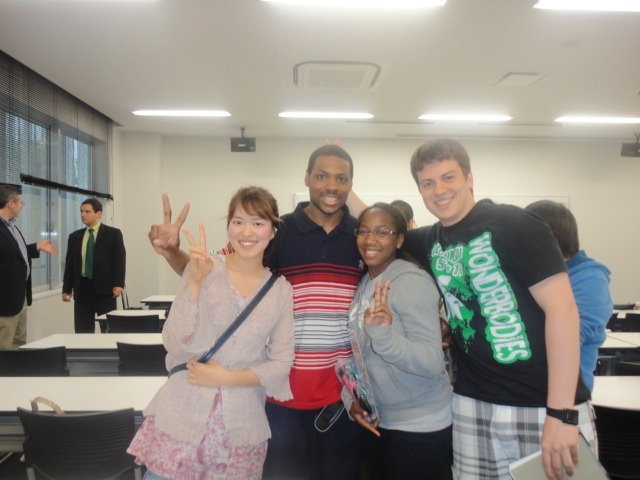 Group picture with some of the Keio students! At the end of our first week, we visited Keio University. It was a small, but impressive looking campus. 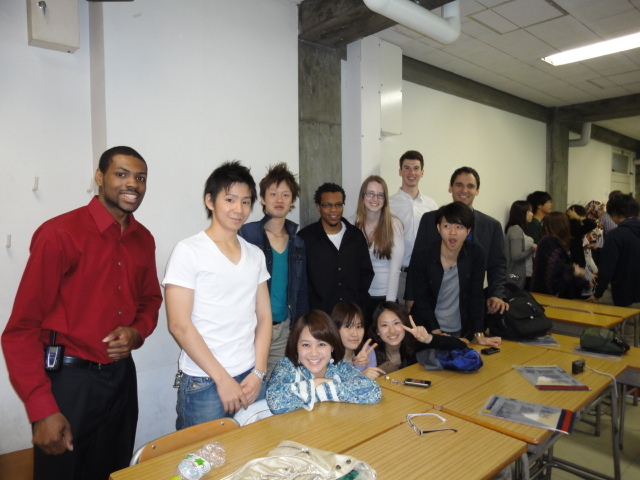 Almost immediately we were taken to meet the class in which two of our students were to present in front of. First, one of their students presented on the use of Twitter in Japan. It was well presented and you could tell a lot of hard work and research went into it. It also helped that the presenter spoke English fluently as she had studied in the United States before. Afterwards, Nicholas presented and his presentation was equally impressive as he worked hard on it. If he was nervous, it didn’t show. 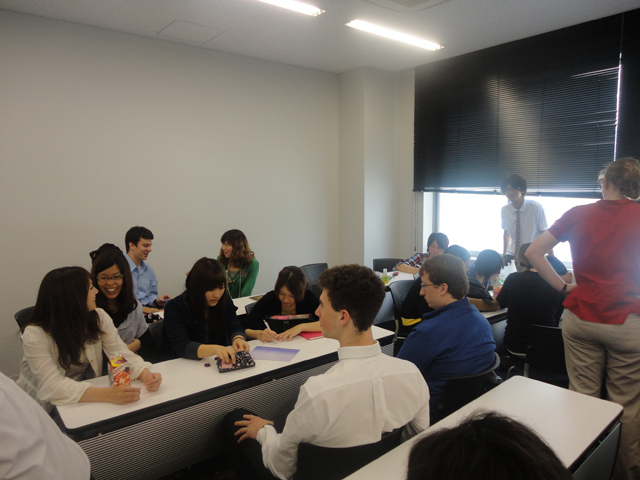 Our class was all spread apart and mixed in with the Keio students. For me at least, it was easy to make conversation with the students at our table. They were very friendly and curious to know more about us and there were at least three students in our group who spoke fluent or near-fluent English. I was very grateful to the students who helped us order food in the cafeteria as well. It was fun getting to know them and letting them get to know us during, and after lunch. Overall, it was fun to meet students from another country, in their own country. They were all very friendly and if it was possible, I wouldn’t have mind hanging out with them outside of class.